354th Fighter Wing Headquarters building. Hursey Gate at Eielson, the primary access point to and from the base. A partial interchange was built on the Richardson Highway in conjunction with the relocation and rebuilding of the gate. One of two control towers at Eielson Air Force Base. This tower is structurally attached to the aircraft hangar behind. The hangar, the base's largest, is known colloquially as "The Thunderdome". A U.S. Air Force EMD GP40-2 locomotive sits outside Eielson AFB's central heat and power plant. The base owns two of these engines, both moving coal and rail traffic across the 11 mi (18 km) rail system. Mile 26 Satellite Field (now Eielson AFB) 1945. Eielson AFB was named in honor of polar pilot Carl Ben Eielson. The 354 FW is currently commanded by Colonel Benjamin W. Bishop. Bishop is a Command Pilot with more than 2,500 flight hours, including over 340 combat hours. He's flown the T-37, T-38, F-15E, F-35A, and F-16C/D aircraft. He is responsible for providing realistic combat adversary training to United States and allied forces in air, space, and information operations via RED FLAG-Alaska, Pacific Air Forces’ premier multinational large-force training exercise, and through PACAF's only Aggressor Squadron. He also directs the preparation and deployment of Airmen in support of global operations, enables the staging of forces through Eielson, and integrates air component capabilities into the US Army's I Corps through the 1st Air Support Operations Group. Additionally, Colonel Bishop is overseeing preparations for the arrival of the F-35A Lightning II aircraft at Eielson Air Force Base. 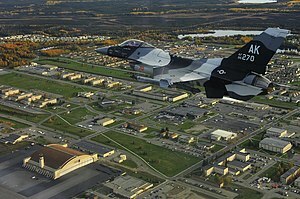 Eielson is home to the 354th Fighter Wing which is part of the Eleventh Air Force (11 AF) of Pacific Air Forces. The 354th Fighter Wing mission is to "Prepare U.S. and partner forces for 21st century combat and to project and integrate Airpower in support of worldwide operations." The wing vision is "An elite team of pioneering Airmen forging Airpower's frontier through world-class training, engagement, and readiness for 21st century combat." The wing has six priorities which are: "Strong Airmen and Families, Resilient Airfield and Infrastrucutre, Preparation for 2 x F-35 Combat Squadrons, Premier Joint/Air Exercises and Adversary Support, Synchronized Airpower into Army I Corps Ops, and OPLAN-Focused Readiness." Airmen who are stationed on Eielson commonly refer to themselves as "Icemen" due to the frigid Alaskan weather. Their wing motto is: "Ready to go at fifty below!" On 7 June 1943, the Western Defense Command ordered construction of a new airfield near present-day Fort Wainwright, then an Army airfield named after Major Arthur K. Ladd. Because of its hazard-free approaches and relatively flat terrain, surveyor reports indicated a site a little more than twenty-five miles southeast of Ladd Army Airfield to be the best in the vicinity for military aviation. The field became known as "Mile 26" because of its proximity to a US Army Signal Corps telegraph station and a Richardson Highway milepost marker using the same designation. A month later, contractors and civilian crews from Ladd Field started laying out the new airfield. Actual construction began on 25 August 1943. Crews built two parallel runways, 165 feet (50 m) across and 6,625 feet (2,019 m) long. Other facilities included an operations building, housing for 108 officer and 330 enlisted personnel, and a ten-bed dispensary. The garrison and airfield totaled about 600 acres (2.4 km2). Completed on 17 October 1944, the 14-month project cost about eight-million dollars. Operational uses of Mile 26 were few. Ladd Field served as the debarkation point for the Alaska-Siberia Ferry Route of the lend-lease program and was the hub of activity. Lend-lease aircraft would occasionally land at Mile 26, but there are no records to indicate any lend-lease aircraft ever used the airfield to take off for Russia. Mile 26 closed when the war ended. The base reopened in September 1946, once again as a satellite of Ladd Field. The first USAAF operational unit assigned to Eielson was the 57th Fighter Group, equipped successively with P-38 Lightnings, P/F-51 Mustangs, F-80 Shooting Stars, and F-94 Starfire aircraft. The 57th FG was inactivated on 13 April 1953. On 1 December 1947 Strategic Air Command B-29 Superfortress bombers arrived at Mile 26 Field with the deployment of the 97th Bombardment Wing, Very Heavy, from Smoky Hill AFB, Kansas. The wing reported to Fifteenth Air Force, Strategic Air Command (SAC), although the Yukon Sector of the Alaskan Air Command controlled its operations. At the end of the Alaskan deployment the wing returned to Kansas on 12 March 1948. A year later, however, Eielson moved from under the shadow of Ladd Field when the Alaskan Air Command assumed organizational control. Also in the fall of 1947, Colonel Jerome B. McCauley assumed duties as commander. The primary missions of Mile 26 were to support Arctic training for USAF tactical and strategic units, as well as defend the base itself. Headquarters USAF General Order 2, dated 13 January 1948, redesignated Mile 26 as Eielson AFB. It was named for Carl Ben Eielson, an Alaska aviation pioneer who was killed, along with his mechanic Earl Borland, in the crash of their Hamilton aircraft in 1929. Eielson and Borland were attempting a rescue flight to an icebound ship in the Bering Sea when they were killed. On 1 April 1948, the Eielson AFB Wing (Base Complement) was formed. The host-unit subsequently would be dubbed the Eielson AFB Bomb Wing, and finally, in January 1949, the 5010th Wing. Colonel John L. Nedwed, the third commander of the base since it fell under Alaskan Air Command fifteen months before, became the first to head the 5010th. For the next 34 years, the 5010th (alternately known as the Wing, Composite Wing, Air Base Wing, and lastly, Combat Support Group) served as host-unit at Eielson. 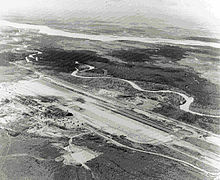 Construction boomed at Eielson AFB during the 1950s. Many of the facilities still in use today were built at that time, including Amber Hall, the Thunderdome, Base Exchange, Gymnasium, Theater, some of the schools, and many of the dormitories. The 720th Fighter-Bomber Squadron, equipped with F-86 Sabres, was deployed to Eielson during 1954–55. The 720th was a part of the 450th Fighter-Bomber Wing stationed at Foster AFB, Texas. The 720th was replaced by the 455th Fighter-Bomber Squadron (323d FBW), stationed at Bunker Hill AFB, Indiana. The Air Defense Command deployed interceptors to Eielson during the 1960s. Det. 3, 317th Fighter-Interceptor Squadron from Elmendorf AFB Alaska deployed F-102 Delta Daggers and F-106 Delta Darts to the base between 1960–69. Today the 1st Brigade 25th Infantry Division and the 4th Brigade 25th Infantry Division can be found training there. Several important large scale winter field programs have been conducted here over the years as well, seeing large numbers of not only U.S. Army ground combat units from the lower 48 states, but also U.S. Marine Corps units, and even Canadian troops. The 375th Weather Reconnaissance Squadron, from the 308th Bombardment Group at Tinker AFB Oklahoma, arrived at Eielson on 5 March 1949. The 308th flew WB-29 Superfortresses. The unit was redesignated the 58th Strategic Weather Squadron on 21 February 1951 as part of the 303d Bombardment Wing at Davis-Monthan AFB Arizona. The 58th Weather Squadron remained at Eielson until 8 August 1958. In July 1960, the Strategic Air Command stationed the 4157th Combat Support Group (later Strategic Wing) at Eielson. The 6th Strategic Wing (6 SW) replaced the 4157 SW on 25 March 1967, relocating from Walker Air Force Base, New Mexico after its closure. The 6th SW flew RC–135 strategic reconnaissance missions with an assigned squadron, and, with KC–135s deployed to Eielson from SAC, AFRES, and the ANG, conducted Alaska Tanker Task Force (ATTF) missions to support reconnaissance and numerous exercises for the Air Force and Navy. The 6th SW remained at Eielson AFB until 1992. A new chapter for the base began 1 October 1981 when the 343d Composite Wing replaced the 5010th as Eielson's host unit. Flying squadrons assigned to the new wing included the 25th Tactical Air Support Squadron (TASS) and the 18th Fighter Squadron (18 FS). The 25 TASS, at Eielson since 1971, flew O-2 Skymaster and OV-10 Bronco aircraft until its inactivation in 1989; the newly assigned 18 FS operated A-10 Thunderbolt IIs until it converted to F-16 Fighting Falcons in 1991. In 1984, the 343d Composite Wing was redesignated a Tactical Fighter Wing. Seven years later, in 1991, it was redesignated as the 343d Wing. Also that year, the 343d gained a second flying unit, the 11th Tactical Air Support Squadron (11 TASS), which flew OA-10s. 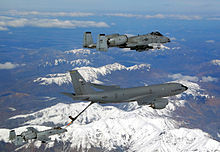 An A-10 Thunderbolt II is refueled mid-air by a KC-135 Stratotanker from the Alaska Air National Guard's 168th Air Refueling Wing. A C-130 Hercules airplane from the Spanish Air Force parks on the flightline for its stay during Red Flag-Alaska 07-3 at Eielson Air Force Base. On 20 August 1993, the 354 FW replaced the 343d Wing. No personnel or equipment were affected by the change. Prior to its shutdown, the 343d was the oldest surviving air combat unit in Alaska, with a lineage dating back to the Aleutian Campaign. The 18 FS, whose history also dated back to World War II, remained active, but the 355 FS replaced the 11th TASS. Another change involved the 3rd Fighter Training Squadron, which was replaced by the 353rd Fighter Squadron (later redesignated as a Combat Training Squadron). Within the first year of its arrival the 354 FW hosted an Arctic combat search and rescue exercise between the United States, Canada, and Russia. Ironically, these were the same countries that took part in the search and recovery efforts that followed the fatal crash of Carl Ben Eielson and his mechanic, Earl Borland, in 1930 as they were attempting to fly relief supplies to the Nanuk. Note: The 343d FW 3d Fighter Training Squadron was replaced by the 353d Fighter Training Squadron from the 354th FW. The 3d Fighter Training Squadron had its origins with the 3d Tactical Fighter Squadron at Korat Royal Thai Air Force Base, Thailand, being formed in March 1973. The 3d TFS received its A-7D aircraft from the then deployed 353d Tactical Fighter Squadron of the 354th Tactical Fighter Wing, deployed to Korat from Myrtle Beach AFB, South Carolina. Eielson Air Force Base was proposed to be a Superfund site on 14 July 1989, and was officially designated as such on 21 November 1989. The groundwater contains lead and volatile organic compounds (VOCs) like benzene, xylene, and toluene. Several areas of underground petroleum-contaminated soil and floating petroleum product are the sources of continuing groundwater contamination. Ingesting or coming into direct contact with contaminated groundwater or soil can pose a potential health threat. Polychlorinated biphenyl (PCB)-contaminated fish were also found in the area. Construction of the superfund site was complete in 1998. In 2014, Eielson tested waters and soils for perfluorinated compounds around areas where "Aqueous Film Forming Foam" had been used for firefighting and training. In March 2015, the base changed its source of drinking water, because contamination had been found. In April 2015, wells near Moose Creek, Alaska, the community to the north, were tested and found contaminated. In July 2015, water from 132 Moose Creek wells, which serve more than 200 residences, was found to contain perfluorooctane sulfonate (PFOS) above the health advisory level of 0.2 micrograms per liter by the U.S. Environmental Protection Agency. The highest reading in Moose Creek was 2.09 micrograms per liter, and the highest level on Eielson reached 2,000 micrograms per liter at the site of a KC-135 aircraft fire in 1989. The Alaska Department of Environmental Conservation said "contamination stretches 6.5 miles from the south of Eielson's runway to the north of Moose Creek and is found up to 100 feet deep". As of August 2015[update] the extent of contamination was unknown and if there was one large plume or multiple small ones. The Air Force has held meetings to discuss the type of water filtration systems for affected homes. As of May 2016[update], between 145 and 150 homes had well water with PFOS above the EPA health advisory concentrations; with EPA's national water quality standard announced in May 2016, 15 more homes in the Moose Creek community were added. Eielson Air Force Base first appeared on the 1970 U.S. Census as an unincorporated area. In 1980, it was made a census-designated place (CDP). As of the census of 2000, there were 5,400 people, 1,448 households, and 1,414 families residing on the base. The population density was 40.1/km² (103.8/mi²). There were 1,531 housing units at an average density of 11.4/km² (29.4/mi²). The racial makeup of the base was 81.7% White, 9.4% Black or African American, 0.6% Native American, 2.1% Asian, 0.2% Pacific Islander, 2.2% from other races, and 3.9% from two or more races, and 5.8% of the population were Hispanic or Latino of any race. There were 1,448 households out of which 77.8% had children under the age of 18 living with them, 92.4% were married couples living together, 2.7% have a female householder with no husband present, and 2.3% were non-families. 2.1% of all households were made up of individuals and 0.0% had someone living alone who is 65 years of age or older. The average household size was 3.52 and the average family size was 3.55. At the base the population was spread out with 40.8% under the age of 18, 16.6% from 18 to 24, 41.2% from 25 to 44, 1.2% from 45 to 64, and 0.2% who are 65 years of age or older. The median age was 22 years. For every 100 females there were 110.3 males. For every 100 females age 18 and over, there were 114.7 males. The median income for a household in the base was $35,938, and the median income for a family was $35,688. Males had a median income of $24,961 versus $21,432 for females. The per capita income for the base was $11,512. 6.0% of the population and 5.1% of families were below the poverty line. Of the total population, 7.5% under the age of 18 years and 0.0% of those 65 and older were living below the poverty line. On 13 May 2005, The Department of Defense proposed a major realignment of the base as part of the Base Realignment and Closure program. It was decided that Eielson Air Force Base was to remain open. That the 354th Wing's A-10 Thunderbolt II aircraft were to be redistributed to the Air Force Reserve Command's 917th Wing (now the 917th Fighter Group of the 442d Fighter Wing) at Barksdale Air Force Base, Louisiana (three aircraft); to the Air Combat Command's 23d Wing at Moody Air Force Base, Georgia (12 aircraft); and to backup inventory at AMARC at Davis-Monthan Air Force Base, Arizona (three aircraft). This action was part of a larger effort to consolidate the A-10 fleet. The 355th Fighter Squadron (355 FS) was inactivated on 15 August 2007 when the last A-10 departed Eielson. The 18th Fighter Squadron (18 FS) converted to the 18th Aggressor Squadron. This squadron trains in the same manner as the aggressors at Nellis AFB, learning the flying styles and abilities of foreign air forces to train USAF pilots. Aircraft changes entail sending all 18 of its Block 40 F-16 Fighting Falcons to Kunsan Air Base, Korea, and receiving 18 Block 30 F-16Cs from Kunsan. The 18th Aggressor Squadron was officially established on 24 August 2007. The Alaska Air National Guard's 168th Air Refueling Wing and its KC-135 Stratotanker aircraft will remain at Eielson. ^ FAA Airport Master Record for EIL (Form 5010 PDF). Federal Aviation Administration. Effective 31 May 2012. ^ This article incorporates public domain material from the United States Government document "Eielson Air Force Base". 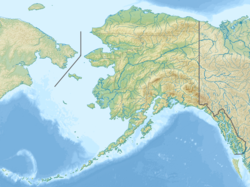 ^ "Eielson Air Force Base - Military Bases". ^ "Biographies - Eielson Air Force Base". ^ "Eielson welcomes new fighter wing commander". Eielson Air Force Base. Retrieved 7 July 2018. ^ Hanlon, Tegan. "The first F-35 jet is being tested at Eielson Air Force Base. The Fairbanks area is preparing for a population jump. About $550 million will be spent on construction and renovation projects for the F-35 program. The projects include renovating airmen's dormitories and building a new child care center. There will also be a new building to house a flight simulator and a new maintenance hangar". ADN. Retrieved 30 October 2018. ^ Zani, Elias. "Ready to Go at 50 Below". Eielson AFB Homepage. Air Force. Retrieved 31 October 2018. ^ "EIELSON AIR FORCE BASE, EPA ID# AK1570028646, Last Update: April, 2002". Yosemite.epa.gov. Archived from the original on 14 September 2005. Retrieved 29 April 2013. ^ "Superfund Site Progress Profile EIELSON AIR FORCE BASE (EPA ID: AK1570028646)". EPA. 23 June 2009. Retrieved 26 August 2015. ^ Sam Friedman (22 May 2015). "Air Force to test Moose Creek wells for groundwater contamination". Fairbanks News Miner (AK). Retrieved 3 September 2015. ^ Robin Wood (24 August 2015). "Air Force to hold meeting about Moose Creek water contamination". Fairbanks News-Miner (AK). Retrieved 26 August 2015. ^ Sam Friedman (20 May 2016). "More homes affected by foam pollution at Eielson". newsminer.com. Retrieved 25 May 2016. ^ a b c "American FactFinder". United States Census Bureau. Archived from the original on 11 September 2013. Retrieved 2008-01-31. Ravenstein, Charles A. (1984) Air Force Combat Wings Lineage and Honors Histories 1947–1977. Maxwell Air Force Base, Alabama: Office of Air Force History. ISBN 0-912799-12-9. Mueller, Robert (1989). Air Force Bases Volume I: Active Air Force Bases Within the United States of America on 17 September 1982. Office of Air Force History. Wikimedia Commons has media related to Eielson Air Force Base.